For other uses, see Shiloh (disambiguation). Shiloh (/ˈʃaɪloʊ/; Hebrew: שִׁלוֹ ,שִׁילֹה ,שִׁלֹה, and שִׁילוֹ variably) was an ancient city in Samaria mentioned in the Hebrew Bible and Christian Old Testament. It has been positively identified with modern Khirbet Seilun, a tell or archaeological mound, called in Modern Hebrew Tel Shiloh. 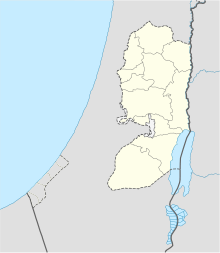 It is located in the West Bank, to the west of the modern Israeli settlement town of Shilo and to the north of the Palestinian town of Turmus Ayya. Relative to other archaeological sites, it is south of ancient Lebonah and 16 kilometres (10 mi) north of Bethel. Shiloh was the major Israelite worship centre before the first Temple was built in Jerusalem. The meaning of the word "Shiloh" is unclear. Sometimes, it is translated as a Messianic title that means He Whose It Is  or as Pacific, Pacificator or Tranquility that refers to the Samaritan Pentateuch. Regardless, the name of Shiloh the town is derived from שלה (shala) and may be translated as Tranquility Town (or Fair Haven or Pleasantville). Mentioned in the Books of Joshua, Judges, 1 Samuel, 1 Kings, Psalms, and Jeremiah, Shiloh is situated north of Bethel, east of the Bethel–Shechem highway, and south of Lebonah in the hill-country of Ephraim (Judg. 21:19). Shiloh was identified unambiguously with Khirbet Seilun (Tel Shiloh) by American philologist E. Robinson in 1838. The location had been established long before by the Roman writer Eusebius, and by Nestorius ha-Parhi. Long before the advent of the Israelites, Shiloh was a walled city with a religious shrine or sanctuary during Middle and Late Bronze Age Canaan. When the Israelites arrived in the land, they set up there the ancient wilderness tent shrine (the Tent of Meeting: Heb. Ohel-Mo'ed). There Joshua and Eleazar divided the land among the tribes who had not yet received their allocation (Joshua 18:1-10) and dealt with the allocation of cities to the Levites (Joshua 21:1-8). Subsequently, Shiloh became one of the leading religious shrines in ancient Israel, a status it held until shortly before David's elevation of Jerusalem. The whole congregation of Israel assembled together at Shiloh and set up the tent (or tabernacle) of the congregation there (Joshua 18:1). The tabernacle had been built under Moses' direction from God (Exodus 26) to house the Ark of the Covenant, also built under Moses' direction from God (Exodus 25). According to Talmudic sources, the tent sanctuary remained at Shiloh for 369 years  until the Ark of the Covenant was taken into the battle camp at Eben-Ezer (1 Samuel 4:3–5) and captured by the Philistines at Aphek (probably Antipatris). At some point during its long stay at Shiloh, the portable tent seems to have been enclosed within a compound — a Greek "temenos". It was at Shiloh that Eli and Samuel ministered (1 Samuel 3:21) and Shiloh was the site of a physical structure that had "doors" (1 Samuel 3:21). At some point, the Tent of Meeting was moved to Gibeon, which became an Israelite holy site under David and Solomon. Shiloh was one of the main centers of Israelite worship during the pre-monarchic period, by virtue of the presence there of the Tent Shrine and Ark of the Covenant. The people made pilgrimages there for major feasts and sacrifices, and Judges 21 records the place as the site of an annual dance of maidens among the vineyards. According to 1 Samuel 1–3, the sanctuary at Shiloh was administered by the Aaronite high priest Eli and his two sons, Hophni and Phinehas. According to this account, the young Samuel was dedicated by his mother Hannah there, to be raised at the shrine by the high priest, and his own prophetic ministry is presented as having begun there. Hophni and Phinehas are noted as malicious in their dealings with those who came to the shrine to offer sacrifices (1 Samuel 2:12-17). It was under Eli and his sons that the Ark was lost to Israel in a battle with the Philistines at Aphek. W.F. Albright, hypothesized that the Philistines also destroyed Shiloh at this time; this conclusion is disputed, but supported by traditional commentary. The place may have been destroyed later as well, and the biblical text records no such claimed destruction. Certainly, the shadowy figure of Ahijah the Shilonite, who instigated the revolt of Jeroboam, the son of Nebat, against David's grandson Rehoboam (I Kings 11, 14), came from there, and he bore the same name as the Aaronite priest that consulted the Ark for Saul in I Samuel 14:3. Schley has claimed that the capture of the Ark and the death of Saul occurred in the same battle and that the later Davidic editors redacted the texts to make it appear as if Saul had ruled without either Tent Shrine or Ark, and thus without sacral legitimacy. This claim is disputed. What is certain is that during the prophetic ministry of Jeremiah (Jeremiah 7:12-15; 26:5-9, 41:5) over three hundred years later, Shiloh had been reduced to ruins. Jeremiah used the example of Shiloh to warn the inhabitants of Judah and Jerusalem what Yahweh Elohim will do to the "place where I caused my name to dwell," warning them that their holy city, Jerusalem, like Shiloh, could fall under divine judgment. St. Jerome, in his letter to Paula and Eustochium, dated about 392–393, writes: "With Christ at our side we shall pass through Shiloh and Bethel " (Ep.46,13, PL 22, 492). The official church of Jerusalem did not schedule an annual pilgrimage to Shiloh, unlike Bethel. On the contrary, Samuel's feast was held on August 20 in the village of Masephta (Mizpah). Even the pilgrims seemingly did not visit Shiloh, for the only one that mentions its name—the sixth-century pilgrim Theodosius (ch. 4, CCSL 175, 116)—wrongly locates it midway between Jerusalem and Emmaus. The mistaken identification lasted for centuries, as appears, for example, on the Florentine map of 1300, which places Shiloh at Nebi Samwil, where the Tomb of Samuel is found. The 6th-century mosaic map of Madaba wrongly locates Shiloh east of Shechem, omitting the depiction of the church. In 638 the Muslims conquered the area of Palestine. Muslim pilgrims to Shiloh mention a mosque called es-Sekineh where the memory of Jacob's and Joseph's deeds was revered. The earliest source is el-Harawi, who visited the country in 1173 when it was occupied by the Crusaders and wrote: "Seilun is the village of the mosque es-Sekineh where the stone of the Table is found". Yaqut (1225) and el-Quarwini (1308, Marmardji, 94–95), write similarly. Archaeological excavations have shown that the place was already settled from about 1750 BCE (Middle Bronze II or MB II, otherwise known as MB IIB according to the Albright school); however, it is not mentioned in any pre-biblical source. A tell and many impressive remains have been unearthed from the Caananite and Israelite eras, with habitation lasting until the 8th century BCE. During the following 12 centuries Shiloh is solely noted as a station on sojourners' routes, usually having only its religious-historical significance to offer. Archaeological excavations have revealed remains from the Roman and Persian as well as Early and Late Muslim periods. Soundings were first made in 1922 by Aage Schmidt. A Danish team led by Hans Kjær (overseen by W.F. Albright) excavated for three seasons between the years 1926-32. A probe was done by Sven Holm-Nielson and Marie-Louise Buhl in 1963. An extensive excavation was done by Israel Finkelstein during the years 1981-84. Since 2006 further excavations took place there. Finkelstein's work established eight strata, ranging from Middle Bronze II to the Byzantine period. A massive wall is attributed to the Middle Bronze III (MB IIC) stage, preserved at a height of 7.3 metres (24 ft) and width up to 5.5 metres (18 ft), with an extensive glacis. The Iron I (Israelite) remains yielded a pillared two-storey public building near the top of the tell, the earliest attributed to Israelites. Collared rim storage jars and some cultic items were found in these buildings, pointing to usage as part of a cultic complex. More than 20 silos were uncovered from this era, included one with carbonized wheat. The destruction layer evident throughout the tell may have occurred in the wake of the Philistine victory at Eben-Ezer. According to radiocarbon dating by Finkelstein, the site was abandoned around 1050 BCE, and then sparsely repopulated during the Iron II period. Jeremiah's admonition in the course of his temple sermon, "Go now to my place that was in Shiloh" (Jeremiah 7:12), would have occurred during this era. One of the more intriguing finds was that of a heap of pottery outside the city wall before the advent of the Israelite culture (c. 1000 BCE). This pile of pottery was the remnant of a number of animal sacrifices, which were tossed over the wall after completion of the ritual and then buried. This find points to a sacral status of Shiloh during the Canaanite period, a status adopted by the Israelites. The top of the tell, where Finkelstein supposes that the tabernacle would have been placed, is now exposed bedrock, offering no clues concerning Israelite worship (aside from the adjacent storage complex). More substantive villages emerged in the Roman and Byzantine periods. Excavations from 2006 to 2007, carried out adjacent to and just south of Tel Shiloh, exposed elaborate mosaic floors as well as several Greek inscriptions, one explicitly referring to the site as the "village of Shiloh". During August–September 2006 archaeological excavations were carried out adjacent to the tell of Shiloh. A team led by the Archaeological Staff Officer for Judea and Samaria in Israel's Civilian Administration Antiquities Unit, performing a clean-up operation at Shiloh this summer, a belated continuation to a previous 1998 dig, discovered the mosaic floor of a large Byzantine church which was probably constructed between 380 and 420 AD. Three Byzantine basilicas have now been uncovered. The length of one, excavated by Hans Klær in the late 1920s, is 40 metres (130 ft). The width, also measured externally, is 14.10 metres (46.3 ft), but a 6.40-metre (21.0 ft) wide room adjoins the building on the south side. This church had three naves, and 12 bases and two beautiful Corinthian capitals 62 cm (24 in) high and 72–61 cm (28–24 in) wide are preserved. Their appearance recalls the well-known fourth-century style, with separate leaves revealing the ribbing of the back leaves, and a smooth leaf under the corner. A structure discovered in 2006 lies under a Muslim free-standing structure known as Weli Yetaim. It seems to have suffered problems of water drainage in its western section despite the installation of run-off pipes and troughs. It appears that the solution was to raise the level of the church[dubious – discuss] and the laying of a new mosaic floor. It was the older, original floor at the lower level that was revealed during the summer of 2006. The mosaic contains geometric designs, a cross, flora representations and three inscriptions, one, a dedication of a bench, the second, a salute to the residents of "Siloun" (as set in mosaic in Greek script: "CIλOYN") and the third, a general wish for good tidings. Another discovery of an addition to one of the basilicas occurred in 2013. Shiloh is mentioned in the Hebrew Bible in Genesis as part of the benediction given by Jacob to his son Judah: "The scepter shall not depart from Judah, nor a lawgiver from between his feet, until Shiloh comes, and unto him shall the gathering of the people be." (Genesis 49:10). It could be a figure, perhaps the Messiah, or a place, as mentioned later in Judges and also in Jeremiah 41:5. A resident of Shiloh was the prophet Achiyah mentioned in I Kings 14. Messianic Christians became attached to Shiloh as a result of this verse. Shiloh is believed to refer to Jesus by some Christians. Alternative translations have led others, including some Christians, to different conclusions. ^ "Shiloh, Israel's Capital for 400 Years, Being Uncovered," Gil Ronen, July 28, 2010, Jerusalem Post. ^ Donald G. Schley, Shiloh: A Biblical City in Tradition and History" Sheffield: JSOT Press, 1989, 2009, pp. 191ff. ^ LaMar C. Berrett, D. Kelly Ogden, Discovering The World of The Bible, page 94 (Grandin Book Company, 1996). ISBN 0-910523-52-5. Cf. Also Schley, 1989, 2009, pp. 191ff. ^ The King James Version and New King James Version use 'tabernacle'; the American Standard Version and New International Version use 'tent. ^ "Zevachim 118B". Mechon-mamre.org. Retrieved 2013-08-17. ^ Schley, 1989, 2009, pp. 184-199. ^ "1 Kings 14:6–16". Mechon-mamre.org. Retrieved 2013-08-17. ^ Schley, 1989, 2009, pp. 191-197. ^ "Ancient church discovered at site where Ark of the Covenant once stood". Israel Hayom. Retrieved 25 December 2015. ^ Ripley, George; Dana, Charles A., eds. (1879). "Shiloh, a town of ancient Palestine" . The American Cyclopædia. Buhl, Marie-Louise, & Svend Holm-Nielsen, Shiloh--The Danish Excavations at Tall Sailum, Palestine, in 1926, 1929, 1932 AND 1962: The Pre-Hellenistic Remains. Copenhagen: The National Museum of Denmark, 1969. Finkelstein, Israel, et al. Shiloh: The Archaeology of a Biblical City. Tel Aviv, 1993. Schley, Donald G. Shiloh: A Biblical City in Tradition and History, Sheffield, 1989, 2009. This is the only in-depth study of Shiloh from a textual, historical and archaeological perspective available; provides an exhaustive bibliography going back to 1805, which includes Albright's critical articles and insights. Wikimedia Commons has media related to Tel Shilo. photos of the Mosaic from Tel Shiloh "Church of the ark found in the west bank"
This page was last edited on 17 April 2019, at 10:38 (UTC).